I was pretty saucy during Carnival Cruise's latest press conference, but I immediately sobered up when their keynote speaker announced their new cruise ship launching in 2016 will be the first of its kind to feature a fully functional, on-board brewery. Seriously, their newest fleet addition, the Carnival Vista, will brew its own line of beers on the ship. 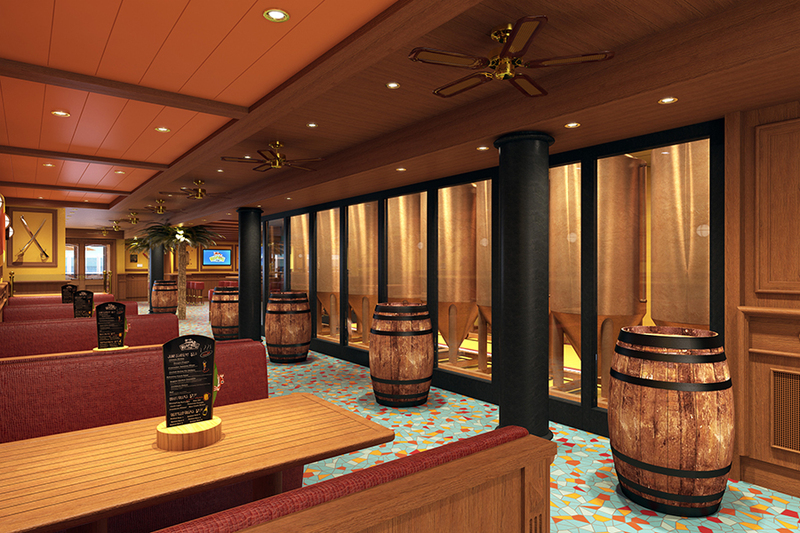 The Carnival Vista brewpub, as seen in the above artist renderings, will showcase tanks for the house-made beer and fermentation tanks will be featured behind a wall of glass. Eddie Allen, the line's vice president for beverage operations mentions that "We're milling everything on site." He went on to note that they are building a grist mill on a lower deck to process the grains needed for the brewing process. The 4,000-passenger ship is estimated to have cost upwards of $800 million to create and is indeed a larger ship than the Titanic. Its maiden voyage is set for May 1st, 2016.